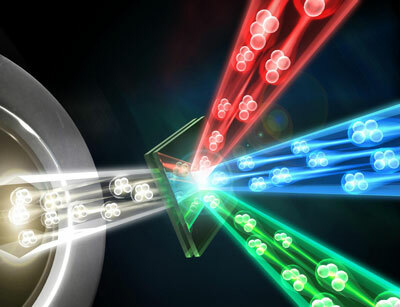 (Nanowerk News) A new protocol for estimating unknown optical processes, called unitary operations, with precision enhanced by the unique properties of quantum mechanics has been demonstrated by scientists and engineers from the University of Bristol, UK, and the Centre for Quantum Technologies in Singapore. The work, published in the June issue of Optica ("Quantum-enhanced tomography of unitary processes"), could lead to both dramatically better sensors for medical research and new approaches to benchmark the performance of ultra-powerful quantum computers. History tells us the ability to measure parameters and sense phenomena with increasing precision leads to dramatic advances in identifying new phenomena in science and improving the performance of technology: famous examples include X-ray imaging, magnetic resonance imaging (MRI), interferometry and the scanning-tunnelling microscope. Scientists are understanding how to engineer and control quantum systems to vastly expand the limits of measurement and sensing is growing rapidly. This area, known as quantum metrology, promises to open up radically alternative methods to the current state-of-the-art in sensing. In this new study, the researchers re-directed the sensing power of quantum mechanics back on itself to characterise, with increased precision, unknown quantum processes that can include individual components used to build quantum computers. This ability is becoming more and more important as quantum technologies move closer to real applications. Dr Xiao-Qi Zhou of Bristol's School of Physics said: "A really exciting problem is characterizing unknown quantum processes using a technique called quantum process tomography. You can think of this as a problem where a quantum object, maybe a photonic circuit of optics or an atomic system, is locked in a box. We can send quantum states in and we can measure the quantum states that come out. Our challenge is to correctly identify what is in the box. This is a difficult problem in quantum mechanics and it is a highly active area of research because its solution is needed to enable us to test quantum computers as they grow in size and complexity." One major shortcoming of quantum process tomography is that precision using standard techniques is limited by a type of noise known as 'shot noise'. By borrowing techniques from quantum metrology, the researchers were able to demonstrate precision beyond the shot noise limit. They expect their protocol can also be applied to build more sophisticated sensors that identify molecules and chemicals more precisely by observing how they interact with quantum states of light. Co-author Rebecca Whittaker, a PhD student in Bristol's Centre for Quantum Photonics said: "The optical process we measured here can be used to manipulate quantum bits of information in a quantum computer but they can also occur in nature. For example, our setup could be used to measure how the polarisation of light is rotated by a sample. We could then infer properties of that sample with better precision. "Increasing measurement precision is particularly important for probing light-sensitive samples where we want to get as much information as we can before our probe light damages or causes alterations to the sample. We feel this will have a big impact on the tools used in medical research." The researchers' protocol relies on generating multiple photons in an entangled state and this study demonstrates that they can reconstruct rotations which act on the polarisation of light.